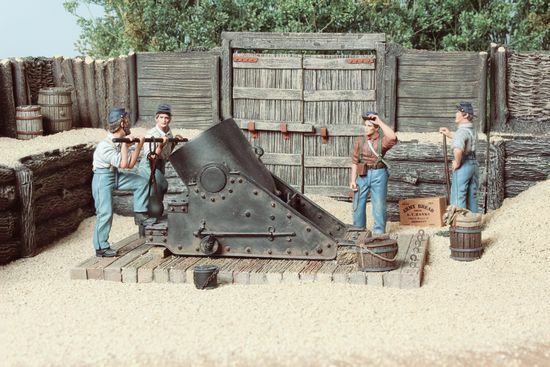 When the Ordnance Board revised the artillery system for 1861, several new patterns emerged including the 8-inch and 10-inch Siege Mortars and the 13-inch Seacoast Mortar. The 8-inch and 10-inch Siege Mortars had maximum ranges of 2,225 and 2,064 yards, respectively, and the 13-inch Seacoast Mortar had a maximum range of 4,300 yards, but their effective ranges were much shorter. These mortars saw action in many different theaters in the American Civil War and were used by both the Army and the Navy. While guns were intended to batter down the walls of a fortification during a siege, mortars were designed to fire explosive shells over the walls of the fortification in a high arcing trajectory, destroying construction and personnel, killing the men inside, forcing others to stay in bombproof shelters, or preventing the gunners from serving their guns and repairing damage caused by the bombardment. Mortars could also destroy structures inside the fortifications which would normally stay unharmed from standard guns. Heavier mortar shells could also penetrate magazines and many bombproof shelters. They could also be used for fire suppression against hostile siege batteries. Seacoast Mortars could penetrate the decks of wooden ships and even threaten the deck plating of ironclad vessels. One of the most famous guns of the war was the well photographed 13-inch “Dictator,” which fired 227 pound mortar shells from a railroad platform propelled by 20 pounds of powder into the Confederate lines during the siege of Petersburg. The official records also site that 13-inch mortars participated in the capture of Island No.10, the reduction of Fort Pulaski, and the actions against Fort Jackson, Fort Saint Philip, Fort Pillow, Fort Pemberton, Battery Wagner and Fort Sumter. The 13-inch mortars were also used in both naval and land based batteries during the siege of Vicksburg and General McClellan placed seven 13-inch mortars in Battery #4 at Yorktown. Spring 2017 Collection - Released May 2018! Spring 2017 Collection - Released January 2019! Partial Shipment Received, Complete Shipment Expected March 2019! Spring 2017 Collection - Released January 2019!